Then I Got To Thinking...: Hello, October! Lovely picture!! I love fall decor, and pumpkin spice candles are the best part of fall!! 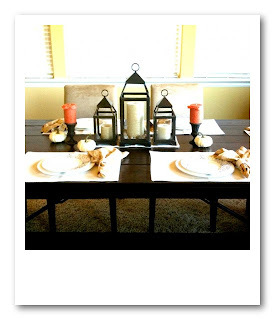 Love the lanterns on your table, they are lovely. I loved how you helped the Chinese family at the airport, so kind of you! Girl, your living room looks like something that would be on Martha Stewart - you did a fab job! October is the best!! You should have a surprise party for TL! I can't wait to hear what you do- his 30th will be here before I know it, too. P.S. I love your table.. Gorg! Just found your blog, and I'm really looking forward to following you!! Love your header!